From the bright lights of Tokyo to the tranquil temples of Kyoto, this fast-paced tour explores Japan's highlights. We take time to reflect at Hiroshima, site of the world's first atomic attack before visiting the holy island of Miyajima, dotted with beautiful temples and free roaming deer. In Kyoto we take tea with enigmatic Geishas and relax in perfectly manicured Zen gardens. Our tour starts in Tokyo, the modern-day capital of Japan. After checking in to our hotel which will be our base for the next two nights, we will enjoy an included dinner with the rest of the group and our Tour Leader. Over one-quarter of the Japanese population live within a 50 km radius of the centre of Tokyo, making it the most populous metropolitan area in the world. The result is a bustling and exciting city - the economic powerhouse of Asia. However, scratching its neon-clad surface reveals a city bursting with history and tradition. A morning stroll to Tokyo's oldest temple, Asakusa, will introduce us to Tokyo's unique culture. We then board a boat for a short journey along the Sumida River. Gaining a totally different perspective of the city, we drift past high rise apartments, secluded gardens and busy warehouses. Arriving in the heart of the city near Hamarikyu Gardens, you may wish to visit the Meiji shrine and Shinjuku area, where the latest electronic gadgets dazzle from glowing shop-fronts. No trip to Japan would be complete without a journey on a high speed train and this morning we leave Tokyo and board the Shinkansen. The bullet trains are known for the extremely punctual service, comfortable carriages and the lack of noise as you travel at speeds of up to 300 kilometres per hour. 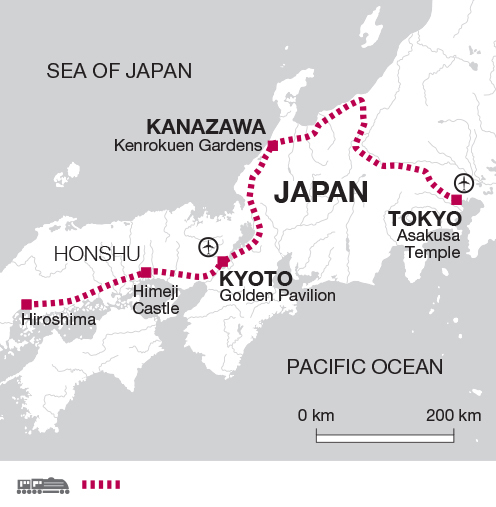 Our destination is Kanazawa, until 150 years ago the 4th largest city in Japan. The city has shunned mass industrialisation and retains the charm of winding back streets, delicate tea shops and the beautiful autumn maples and spring cherry blossoms of Kenrokoen Gardens. Once ruled by the Maeda Clan, one of the most powerful Samurai families in Japan, the city has several traditional samurai districts which we will explore. Tonight we are accommodated in a traditional inn, known as a ryokan, where we sleep on comfortable, folding futon mattresses laid on top of woven tatami mats. Rooms are twin share and because most ryokans are very small it is not possible to offer a single room. Bathrooms are usually shared as rooms are not typically en suite. During our stay, we learn about local etiquette, such as when to take off our shoes and the pleasures of taking a Japanese bath, all of which helps enhance our stay in this traditional establishment. After breakfast we make our way back to the train station for the journey to Kyoto. Kyoto is regarded as Japan's loveliest city, with more than 2000 temples and shrines, many set in perfectly manicured landscaped gardens. We base ourselves in Kyoto for the next four nights to allow ample opportunity to explore the highlights. We will start with a visit to Nijo Castle. Built in 1603 as a Shogun palace, it is a great example of the sumptuous setting in which the Shogun would have held audiences with his samurai warriors. We spend today visiting some of the cities many temples. We start with the Ryoan-ji Temple with its beautiful Zen gardens and famous rock garden. The exact history of the gardens is unknown but it is thought the temple was converted from an aristocrat's villa in 1450. Whilst in the gardens try testing out the theory that at least one of the rocks is hidden from every vantage point. We then explore the famous Golden Pavilion. The temple is a three storey building with the top two tiers covered in gold leaf. Set in a lake the building appears to float on the water and the reflections, coupled with the background of forest make it worthy of its place on many Japanese postcards. We'll enjoy a traditional tea ceremony too, and there is also time to stroll along Kyoto's charming streets and tree-lined canal, simply soaking up its unique atmosphere. An early morning train takes us to Hiroshima, where we will spend the morning exploring this thought-provoking city in our own time. Completely destroyed on 6th August 1945, when it was the target of the first atomic bomb to be used in wartime, Hiroshima has literally risen from the ashes, and is now a thriving, friendly city. We visit the Peace Memorial Park and the well-presented museum on the site of the 1945 A-bomb hypocentre. Whilst serving as poignant reminders of the nuclear holocaust, their over-whelming message is of hope that such horrors will never reoccur. Travel around the city is easy, thanks to the provision of colourful street trams, brought in from all over Japan after the war. Just off the coast of Hiroshima is the tiny island of Miyajima. The relaxed feel of this island is enhanced by the deer that roam freely through the streets. As we arrive on the ferry we can take in the famous view of the floating torii gate. Considered to be one of the most beautiful sights in Japan, these red gates appear to float on the water with the hills of the island forming a spectacular backdrop. We take time to explore some of the islands many shrines before we take the ferry back to the mainland. Today we travel to the city of Himeji in Hyogo Prefecture. The city is known for its original castle. Known as the 'White Egret' owing to the brilliant white walls and winged roof, the castle is unlike others in the country having escaped damage by war, earthquake or fires which often destroy these traditional wooden structures. Listed as a World Heritage Site, the castle complex is made up of over 80 buildings and an impressive spiral maze leading up to the entrance which deterred intruders and allowed residents to open fire if the visitors were unwelcome. Close to the castle are Kokoen Gardens where we can try green tea and wander through the relaxing bamboo groves. Our tour ends after breakfast this morning. Rain gear is essential all year. You will need warm clothing from October through until April when temperatures drop, especially at night. December until February are particularly cold so bring extra layers if you are travelling at this time. Comfortable shoes, and sandals for relaxing. One main piece of baggage and a daypack. Your main luggage will be transferred directly from Tokyo to Kyoto therefore you will need to use your daypack to carry everything you need for the overnight stay in Kanazawa. On this tour we spend one night in a traditional Japanese Inn, known as a Ryokan. Thick futon mattresses are laid out on woven tatami mats and the rooms are very simple. Typically ryokans do not offer en suite accommodation and therefore bathrooms will be shared. Due to the small nature of ryokans a single room cannot be offered.